Remember our post How To book a cheap trip to Vienna and how we went ahead to both Bratislava and Vienna? Now we’ve come to write about Vienna, but first how we had to take the Twin City Liner from Bratislava to Vienna, on the wonderful Danube river. The Twin City Liner was easy to find right below the Bratislava Castle Hill at the Novy Most. 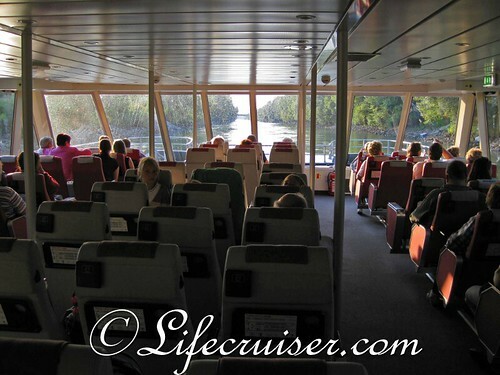 As you can see in the photo below, the Twin City Liner ferry is a Catamaran. It takes about 75 minutes to go from Bratislava to Vienna. The flying saucer thing on the top at the other end of the bridge is actually a restaurant, but we never went there. We had no time left, but also because we were on a budget trip and it’s supposed to be a bit expensive. We were so happy that we had gone with the Danube alternative and not by train, since we had marvelous weather – just perfect for a boat tour! Aboard you could choose to sit inside or on the top deck, there were big panorama windows in the front so you could enjoy the trip. What do you think we did? Right. Sure, it was a bit windy on the deck, but oh, so refreshing after the heat in the city! Yes, Mr Lifecruiser had to hold on to his hat, since he had already been forced to chase it one time when it blew off!!!! The Catamaran even has a small bar aboard where we could buy beer for our thirsty throats…. One thing we missed from land and only saw from the Danube river was the Devin Castle, which is known since the 9th century. It is said to have been blown up in 1809 by the army of Napoleon. It’s a museum there today. If you’re going there, you can take a bus from Novy most. Along the Danube river were a lot of cottages, with a lot of fishing equipment and as you can see the cottages where prepared to meet some flooding of the river, built up on poles. You can do some birdspotting if you have binoculars with you. Other from that there were parts of the boat tour that there wasn’t anything particular to see, so I think that the 75 minutes is just perfect amount of time to spend on that route. Here we have just arrived at the end destination in Danube canal: Schwedenplatz in Vienna City Center. So, how come it’s named Schweden (Sweden)-platz? It was a sign of gratitude to change the name in 1920, because of Sweden’s help efforts after the first World War. Schwedenplatz is a perfect place to arrive at, since you land right in the city center, very close to the Stephansplatz and interesting sights. I instantly LOVED the sight of Vienna! See Lifecruiser Danube River 2008 photo slideshow. What a fun 75 minutes. I would have loved to try that restaurant though. It looks like it has a view to die for. Just saying. Thanks for sharing your trip with us. Have a great day. Comedy Pluss last blog post..What’ll It Be? I also would have loved to visit that restraunt. You go on such neat trips, I would love it! Thanks for taking me on an instant vacation, even if it was only in my dreams. You re-played your short trip very nicely for us. Mahalo for being such a good tour guide. However, I didn’t hear one mention of champagne! What gves?! Only beer for you? Maybe you didn’t have the time. The way you brought us along with your catamaran tour to Vienna is fantastic and made me fell in love with it instantly! Photos are all exceptionally attractive and I can’t imagine how beautiful are other photos of Vienna that you’re going to show us in future…. Cecil Lees last blog post..I’m Back From Shanghai !! Dear cruisers! Thanks for another enjoyable post! I passed through Vienna as a child numerous times during the epoch when my family lived on Cyprus, but I must confess I was too young to look at architecture and scenery. I just thought it was normal for all families to pack up their belongings and to journey in a Volkswagen minibus! Today, I love traveling – the art of discovering new places and imagining what life there would be like! Vienna comes out beautiful through your eyes – it’s easy to see how much you love it!! …which is unfortunately still landlocked – not much boat activity going on here – and beautifully sunny… But so are your pictures!!! I’m so thankful to you especially for all the posts you do about your travels -you and many other bloggers too -give me a chance to see places all over the world that I will never have the opportunity to see in person but from viewing pictures, reading your posts about these places, I feel like I am being transported to so many beautiful places. Don’t ever stop traveling -and then posting about your trips! Love ‘em! u went Danube river! Me too! I went there many years ago but I didn’t take any cruise ride. I think the bridge in one of your picture is the one that I stepped on to take photos. Ur photos brought back some fond memories to me! Whoever thought cockroaches can be cute? 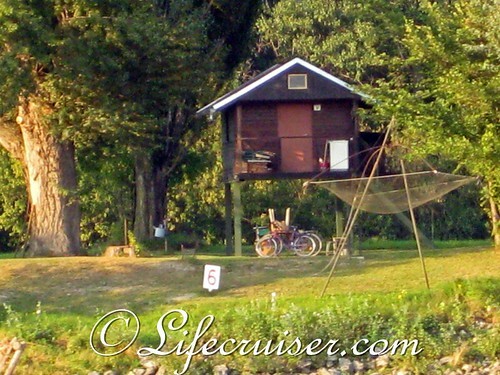 I’m amazed of all the details you did observed and present from your travel up Danube – Donau. Excellent post. And it tempts us to do the same. The bridge restaurant looks like air traffic control. As you said, it looks very expensive without going near the place. Implement a a new internet solution for the organisation. Our present publishing systems is not up to date and consisists of too many plug-ins and have 3 different sources. Yes, I will be very busy for months to come. So I think I’ll bite the bitter Apple and pay for more space to post photos on my present blog. I simply do not have time to cope over more new applications than I allready have taken responsibility for at work. to the both of you. That saucer thingy looks way too high for me. Plus its tilted. They give you any parachutes before you go in for lunch? Wonderful share of photos Captain!! !